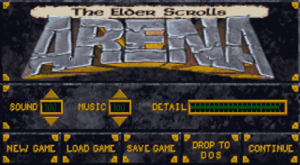 Floppy disk version re-released as a free download in 2004 to celebrate the 10th anniversary of The Elder Scrolls series. ArenaSetup is a pre-packaged installer for Windows, including the CD version of the game. Floppy version: requires manual to answer Shift Gate copy protection questions. Use DOSBox. CD version: disc check. Use DOSBox. This is the CD version pre-packaged with DOSBox. The floppy disk version from the official site (without DOSBox). The GOG.com version is available by purchasing any other game on GOG.com published by Bethesda Softworks. The CD version has voice acting during cutscenes, removes the Shift Gate's copy protection questions, a remastered ending, and small graphical changes to items like shields. The two versions are otherwise identical. The Elder Scrolls Anthology includes the floppy version. Patch 1.06 is the latest patch for the retail floppy version. The CD version and the freeware floppy version are already fully patched. If output= isn't changed from surface and the aspect= command is turned to true, the game will become unplayable. Changing scaler= to "normal3x" will emulate the game in windowed mode at twice the resolution, staying faithful to the original's size. Paired well with aspect=true. Changing the cycles= command to max will force DOSBox to emulate the game at a higher framerate with high detail settings, but animations will be sped up, making NPCs very hard to talk to, as they move too fast. This also applies to enemies. Changing the cycles= command to "fixed 20000" will force the game to play as it should on release, but will become unplayable on higher detail levels due to slowdown. Changing the core= command to "dynamic" will allow the game to run at a higher framerate when using high detail settings, as opposed to "auto." While improving musical fidelity, GeneralMIDI will make various dungeon tracks sound "awkward" due to the new instrument sounds. Some dungeon music won't play if GeneralMIDI or SoundBlaster is used, as both modes have special music. GeneralMIDI seems to have the most variation. When using SoundBlaster, some overworld music, like the snowing music, will have odd, warping-sounding instruments in the background. Each save is comprised of multiple *.0* files, with the extension's number matching the slot it was saved to. NAMES.DAT stores the save file names (saves can still be loaded without it). Key remapping only available while pressing Alt+F1 in DOSBox. Touchscreen rarely works, and only for menus. Use Projet French Arena or ArenaSetup. Some text is English. Reverse engineered fan-made port of the game based on SDL2 which supports Linux and Windows. However, it is still in alpha and the software must be compiled for now. Instructions & requirements are available. This page was last edited on 14 April 2019, at 08:31.